Have a watch party or office bracket for the big tournament? 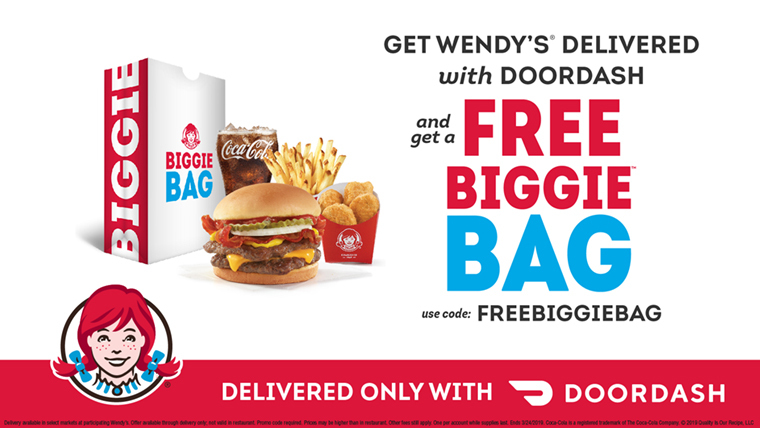 Place a delivery for Wendy’s with DoorDash and get a free** Biggie Bag, which includes our new Bacon Double Stack. Just use promo code FREEBIGGIEBAG at checkout! March is kind of magical. Daylight savings means longer days, it might be starting to feel like Spring (depending on where you are) but perhaps most importantly, there’s this pretty big basketball tournament we’re swept into. Between hiding in the bathroom at work to catch that afternoon tipoff, to spending hours each weekend glued to the couch, it’s fair to say we all go a little mad. We cringe, we shout and maybe (probably) even shed a tear if our team takes it all. Through all these emotions – the highs and the lows – whether you’re stuck in a cubicle or cozy on the couch, We Got You™. No matter how you fan, our new deals have you covered from the first tipoff to those agonizing buzzer beaters. Since this month is college basketball’s big moment, we wanted to celebrate with this not so little thing called the $5 Biggie™ Bag. Featuring our new Bacon Double Stack™, a 4-piece chicken nugget, small fries and a small drink, it’ll carry you through the highs (and hopefully not lows) while taking in ALL the games. The Bacon Double Stack is crafted with two patties of fresh, never frozen beef*, topped with Applewood Smoked bacon, melty American cheese, crunchy crinkle-cut dill pickles, fresh white onions, ketchup and mustard. Consider the Biggie Bag is this season’s MVP. As with all good things, this is a limited time deal, so get it while it’s hot, juicy and available. From 3/18 - 3/24: Score a Junior Bacon Cheeseburger for just $1 (they say a JBC a day keeps the upsets away). From 3/25 – 3/31: Get your large drink for just $1 with purchase (a great way to wash down a victory!). Speaking of victories, DYK that purchasing a large drink, now through April 7, will give you a chance to win free food instantly, $5 Wendy’s mobile app credits for, you guessed it, more food, or even a trip to next year’s tournament? Visit WendysTakeYourShot.com for full details. From 4/1 – 4/9: Snag a free small fry and small drink w/ purchase of any large cheeseburger (We recommend something Made to Crave to keep you satisfied all game long). Get your order ready, it’s game time. * Fresh beef available in the contiguous U.S., Alaska, and Canada. ** Free Item: Offer valid for one (1) Biggie Bag while supplies last, or untilMarch 24, 2019. Not valid for pickup or dine-in. Limit one per person. Fees, taxes, and gratuity apply. All deliveries subject to availability. Must have or create a valid DoorDash account with a valid form of accepted payment on file. No cash value. Non-transferable. Use promo code FREEBIGGIEBAG to redeem. See full terms and conditions at dasherhelp.doordash.com/offer-terms-conditions. + $0 Delivery Fee: Offer valid through March 24, 2019. Valid only on orders with a minimum subtotal greater than $10. Limit one per person. Other fees (including service fee), taxes, and gratuity still apply. All deliveries subject to availability. Must have or create a valid DoorDash account with a valid form of accepted payment on file. No cash value. Non-transferable. No promo code necessary to redeem. See full terms and conditions at dasherhelp.doordash.com/offer-terms-conditions. ++ Delivery via DoorDash available only in select markets at participating restaurants while supplies last. +++ At participating restaurants. Price and participation may vary in Alaska and Hawaii.